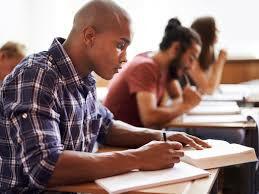 Exam week can be the most stressful time of the semester, whether you're in high school, college or graduate school. Make sure you're prepared with these study tips. Splitting the material into smaller chunks can help it all feel more achievable. If you have a schedule, you can also prioritize your study time and keep track of what you've accomplished and what you still need to do without getting overwhelmed or cramming. Check out this video to see how to make a schedule. When you make your schedule, plan to rest and to mix up the subjects you're studying to make sure you don't burn out. You won’t be able to memorize or comprehend all the material at once. Make sure to switch it up before your eyes glaze over! That way, you can keep studying for longer periods of time while maintaining your focus. Remember that balance is key – reward learning with break times to recharge and relax. And a good night's sleep before the exam is critical to being able to fully focused. Review sessions offer vital information on exam format, what will be on the exam and key concepts you should be focusing your studies on. If your professor does not offer a review session, make sure to attend office hours, since often a professor can give you helpful hints for what to study and ways to prepare for the exam. If you think about and create actual exam questions, you will likely become more familiar with what you need to study and, in the meantime, familiarize yourself with the type of language that will be on the exam. Draft potential exam questions and quiz yourself so that you can set expectations of what you need to focus on. If it’s multiple choice, you’ll need to know definitions and concepts. For essay exams, focus on your understanding of all the concepts presented, with examples in mind. If you have out of class time to write a final paper, your professor will have high expectations of the paper, so make sure to visit the writing center and get help. Create your own study guide. While many teachers provide a study guide, reorganizing your notes to create your own study guide can help you understand the material better. Outlining the important information you need to learn can help you think deeply about what you learned, and give you a good way to quiz yourself while you study. If you’re a visual learner, it can help to color-code your notes or create mind maps or diagrams to visualize how the concepts you’re learning relate to one another. This is especially beneficial when learning concepts that build upon the understanding of one another, like in science courses. Learning by teaching is a method that really works! If you work with a study buddy and explain concepts to one another, you’re re-learning the material all over again. It’s a great way to reinforce what you’ve learned and help someone in the meantime. That said, some study groups get off topic too easily, so make sure that if you study with others, it's actually helpful to your learning process.